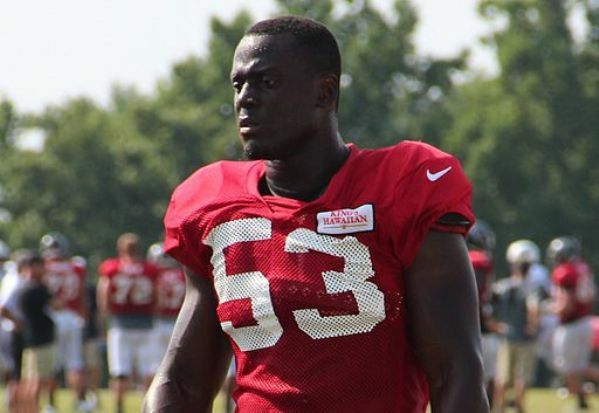 Three months ago, the Atlanta Falcons let linebacker Prince Shembo go after he was slapped with a felony charge of aggravated cruelty to animals for killing his girlfriend’s dog. “We are extremely disappointed that one of our players is involved in something like this,” his former team said in a statement at the time. But now the Falcons are considering bringing Shembo back. Why the change of heart? According to Darin Gantt’s bluntly-but-appropriately titled story, “Falcons to discuss bringing back dog murderer Prince Shembo,” on NBCSports.com, Shembo was able to plead his way out of the felony charge on Aug. 6. His killing of the dog was reduced to a misdemeanor, for which he paid a fine. So, with that irksome felony charge as dead as the little dog, Shembo “cleared league waivers and is currently a free agent,” the Atlanta Journal Constitution reports. And it looks like Shembo may soon have his old job back. “I’m sure that we will [consider re-signing him], but general manager Thomas [Dimitroff] and I have not gotten together on that, at this point,” Falcons coach Dan Quinn told the Atlanta Journal Constitution yesterday. The fact that Shembo will be subject to the NFL’s personal conduct policy should he rejoin the team might give the Falcons pause, wrote Gantt on NBCSports.com. 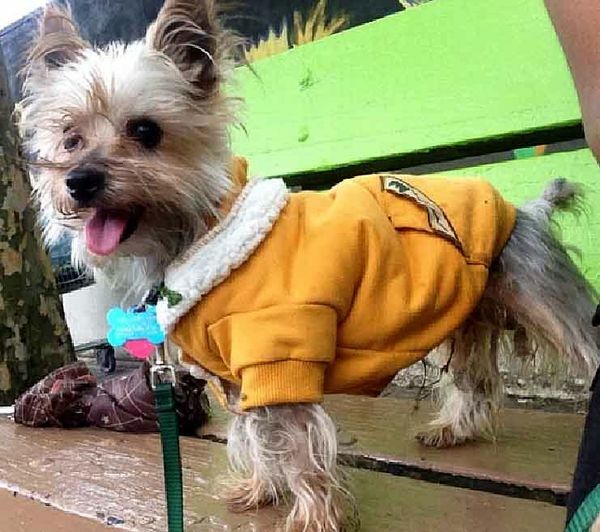 On April 19, Denicia Williams, Shembo’s then-girlfriend, told police she had left Dior, her Yorkshire Terrier, with Shembo. When she returned to Shembo’s apartment, the dog was unresponsive. Dior died a short time later at a local animal hospital. According to the police report, a necropsy revealed that little Dior had suffered a litany of horrific injuries: a fractured rib; fractured liver; abdominal hemorrhage; thoracic hemorrhage; extensive bruising and hemorrhage in the muscles in her front leg and shoulders; head trauma; hemorrhage and edema in her lungs; hemorrhage between her esophagus and trachea; and hemorrhage in the her left eye. The cause of the little dog’s death was blunt force trauma. Williams wisely ended her relationship with Shembo. Shembo is not the only NFL player who has been charged with felony animal cruelty this year. Terence Cody, who was dropped from the Baltimore Ravens, is facing felony charges of intentionally torturing and cruelly killing his dog Taz, a Presa Canarios Mastiff. He is also charged with inflicting unnecessary suffering or pain on his dog; not providing his dog with nutritious food in sufficiency quantity; not providing proper drink; not providing proper space; and not providing necessary veterinary care. Dwight Jones, a former wide receiver for the New York Jets, was charged in April with felony animal cruelty for letting one of his Pit Bull mixes starve to death. Although they haven’t yet been charged, brothers Chris and Ma’ake Kemoeatu left their Cane Corso, Zeus, at a Baltimore boarding facility back in November 2014, before they moved back to Hawaii. Nine months later, Zeus is still at the facility, and the brothers haven’t paid the $9,000 (and growing) boarding and vet fees.